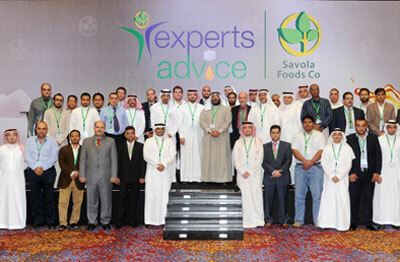 Savola Foods Company, one of the fastest growing multinational food groups in the Mena and Central Asia region, recently organized a two-day seminar in Jeddah to discuss the issues affecting the sugar and vegetable oils market. The seminar, hosted by Mohammed Al-Klaiby, CEO of Savola Arabia, and Mazen Badawood, the VP of Savola Arabia, was aimed at extending the company's efforts to be a solution provider for all its customers, especially the Business to Business (B2B) segment. Top officials from over 50 companies took part in the seminar held at the Jeddah Hilton. It was conducted by James Fry from the renowned consultation company LMC International, which has a big presence in the UK, US, Malaysia and Singapore. Fry gave a presentation on the market intelligence, analysis and future trends for both Sugar and Vegetable Oils. In his overview of world sugar production, Fry pointed out that Brazil produced about 20 per cent of the world’s sugar and was by far the largest exporter in the world, accounting for around 50 per cent of global trade. "What is special about Brazil is that over half of the country’s cane harvest goes to make ethanol as a biofuel, rather than sugar, and this is done in the same sugar mills," explained Fry. "Since most Brazilian mills can switch between sugar and ethanol output, any imbalance between sugar and ethanol prices will quickly lead mills to switch towards the more profitable product and bring their prices back into line with one another," he stated. Brazil drives world sugar prices, but the country’s flex-fuel vehicles keep sugar linked to Brazilian gasoline prices and the prices set by Brazil’s fuel policies are now high enough to stimulate sugar output in other countries, he added. Turning to global markets, Fry said world sugar prices have risen dramatically since 2005, pointing out that in the supply/demand balance three years of deficit severely depleted global stocks. "However, we are moving back to a surplus again. Looking at the market outlook sugar consumption is expected grow by 30-35 million tonnes in 2010-2020, mainly in Asia," he added. On the vegetable oils scenario, Fry said the current oils prices were very high by historical standards. For example, in August 2012 palm oil prices were nearly 90 per cent above their long run trend level.